Rajiv Shah (left) serves as administrator of USAID. Todd Park is U.S. Chief Technology Officer. Photo Credit: USAID, White House. 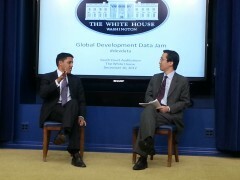 Administrator Shah and CTO Park discuss open data's impact in development. Photo Credit: USAID. This unprecedented event brought world-class innovators and entrepreneurs together with U.S. government leaders and decision-makers to discuss the impact that open development data has already had on strengthening entrepreneurship in the United States and in developing countries—and the additional impact that can be had going forward. We also brainstormed about new partnerships we could form to facilitate the opening of new pockets of data that many of us deal with in our work every day and that have potential added value across the development domain. For USAID, this effort reflects our increasing focus on throwing open the doors of development to problem-solvers everywhere. That’s where we all come in, and that’s why we are issuing a call to action for open data. There are data sets and information resources across the government that could serve a greater good and be effective tools for change if they were made more accessible and usable, while ensuring that privacy and confidentiality are always rigorously protected. We want to collect these data—these potential change agents—and present them in their most creative and effective forms. We want to engage students and volunteers to help us clean and organize the data to make this information accessible and useful, just as USAID’s Development Credit Authority did with its crowdsourcing project to clean up and map loan data records. We want these same data to be available to entrepreneurs and innovators who are building new organizations and creating local and lasting change. Although we often talk about our business-like focus on data and the importance of delivering concrete results, the reality is that the open data movement has been inspired not only by analytical logic but also in large part by a shared passion to help change the world. When you apply your vision and expertise to this task—when you add to the growing stores of data for use in new and creative ways—you are helping an infant take its first easy breath and live to celebrate her fifth birthday. You are helping farmers grow more nutritious foods, fostering healthy families and prosperous communities. You are helping end the enduring outrage of human trafficking. This is the power of open data. We’re excited and think you should be too. Watch a video of the Datajam event. Visit our website for more information about open data and learn more about the Presidential Innovation Fellows. Rajiv Shah is the Administrator of USAID. Todd Park is Assistant to the President and U.S. Chief Technology Officer. Watched the introductory video, can you direct us to results of the datajam? Thanks. This is a welcome development especially to people in the Less Industrialized Nations, i’m aware that with the absence of essentials such as data comes dis-orderliness and irregularities which often fuel corruption as it would almost be impracticable to carry out necessary auditing of what transpired, hence I’m glad that a software is comming all the more to the rescue in addition to pletoria of data software on ground.